The ‘Big Five’ of Africa are renowned and celebrated the world over—lion, leopard, buffalo, rhino and elephant. But the ‘Small Five’? The ones who share names with their famous five counterparts and can fit in the palm of your hand? Nope. The ant lion, leopard tortoise, buffalo weaver, rhinoceros beetle and elephant shrew are as unknown as their namesakes are well-known. 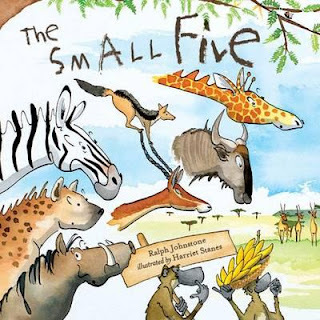 This fun story is about a contest between the ‘Small Five’ and the ‘Big Five’. The ‘Small Five’ are fed up with all the attention given to the ‘Big Five’ and challenge them to tests of skill, will and wits. Doc Croc is the ref and the games are on! Part of the proceeds from the sale of this book will go towards supporting children at the Kenya Children’s Home.